The Cosmic Particle Telescope, short CPT-SCOPE, is an international student project involving students from Norway and Germany. We are constructing a low-cost, small size, fully operational radiation monitor which will be able to detect and study energetic sub-atomic particles. We demonstrate the readiness of new radiation-hard integrated circuit technology for space and near space application. Our project will participate in the BEXUS 20 campaign in October 2015. We will launch our instrument, together with other European student teams, on a stratospheric balloon. 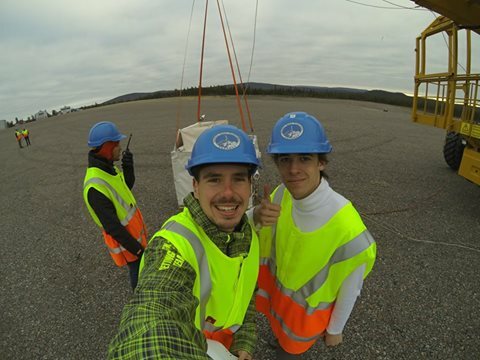 The balloon will fly from the Estranged Space Center (SSC) in Kiruna, northern Sweden. Last week the CPT-SCOPE participated in the Futurescapes symposium for new media, technology and the humanities. Here the CPT-SCOPE encouraged students to engage and participate in programs like REXUS/BEXUS by sharing some of our own experiences through the CPT-SCOPE project. 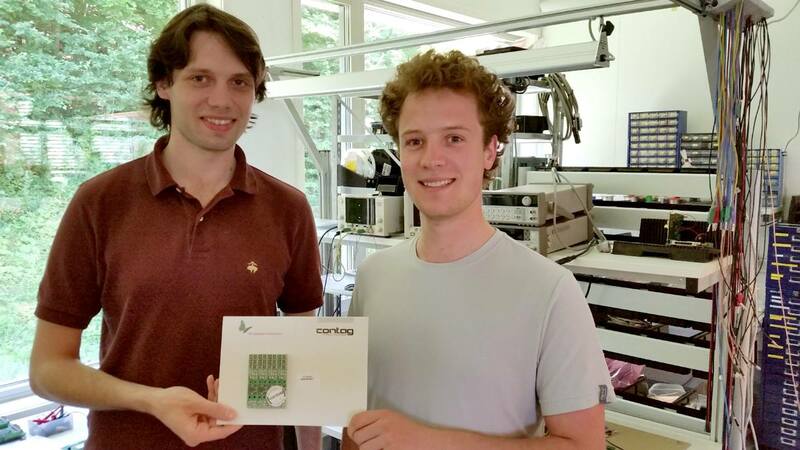 Early this week Timo won the NIFRO prize 2016 for his master thesis! The prize is awarded every year by the Norwegian industry for space activity in cooperation with NAROM to the best Master´s thesis within the fields of space research and technology. This week Timo was interviewed by the Norwegian popular nett-based science and technology magazine www.forskning.no. The article following the interview was published on one of the newspaper´s blogs on Wednesday. On October the 10th at 11:30 LT (09:30 UTC) the BEXUS 20 launched from Esrange Space Center in Kiruna Sweden. 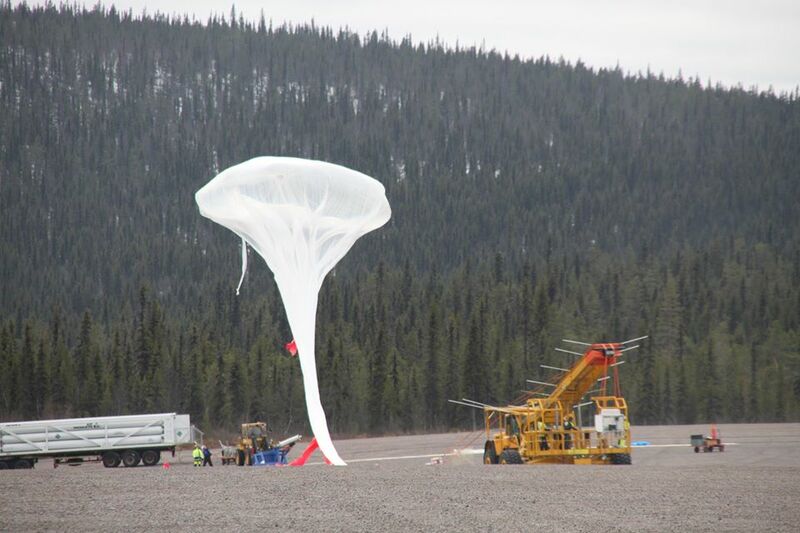 In beautiful weather the balloon reached a good floating altitude at a height of 28km for a distance more than 100km before the balloon was cut over the forest in Lapland. Last Friday the CPT-SCOPE team participated with a stand at the Researcher’s Night at NTNU in Trondheim. During the event several hundred high-school students had the chance to experience science with hands-on experiments. 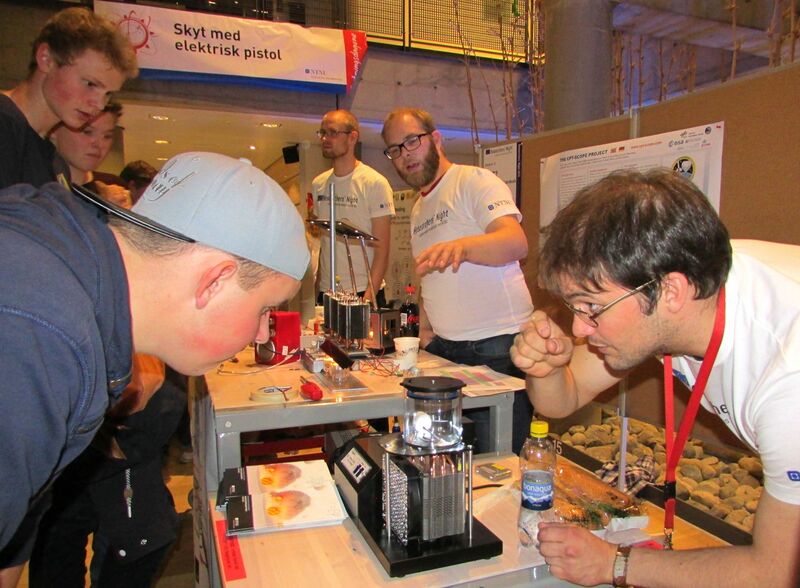 Our stand was a cooperation of the department of physics at NTNU and the CPT-SCOPE team. We had several experiments involving Peltier Elements including a cloud chamber which demonstrated radioactive decays visually. All of the CPT-SCOPE instrument has now gone into a manufacturing phase. The list of parts to be manufactured is quite impressive. A single particle telescope sensor consists of 18 parts, not counting electronics. This means that our entire instrument consists of 53 separate parts. We have begun stress testing our instrument electronics. Last week we subjected our instrument to the first thermal tests, these tests place our instruments in conditions with temperatures below negative 50 degree celsius. Results were promising and more tests are soon to follow to prepare for shipping to the launch site. On Thuesday the first batch of flight electronics arrived at our lab in Oslo. This batch included the sensor board and other electronics that will fly on our mission in Kiruna this October. We would like to thank our industrial PCB sponsor CONTAG in Berlin Germany (http://www.contag.eu/). They very quickly produced and delivered the sensor boards with excellent quality. EN: We charterd a Cessna 172S to test our telemetry unit and ground control software under operating conditions. The tests were showing that our GPS-module can determine the correct altitude just with a proper signal. So we will use an external GPS-antenna for the balloon flight. Read more about CPT-SCOPE is flying! Instrument progress update: Final electronics test. Are all the components and chips correct? Last check of the CPT-SCOPE electronics before we begin manufacturing of the on board flight electronics of the instrument which will fly on the BEXUS 20 campaign in October. What is a good way to make sure that all the components and electronic cards fit; print them and make sure that everything is OK.
Everything seems fine and appears to be working correctly, now to begin manufacturing electronic components. Read more about Instrument progress update: Final electronics test. Copyright © 2019, CPT SCOPE. Theme by Devsaran.